Williamstown Time Ball Tower | Lighthouses of Australia Inc. The lighthouse on Point Gellibrand at Williamstown has had many incarnations. Firstly as a lighthouse, then a timeball tower, then a lighthouse again. 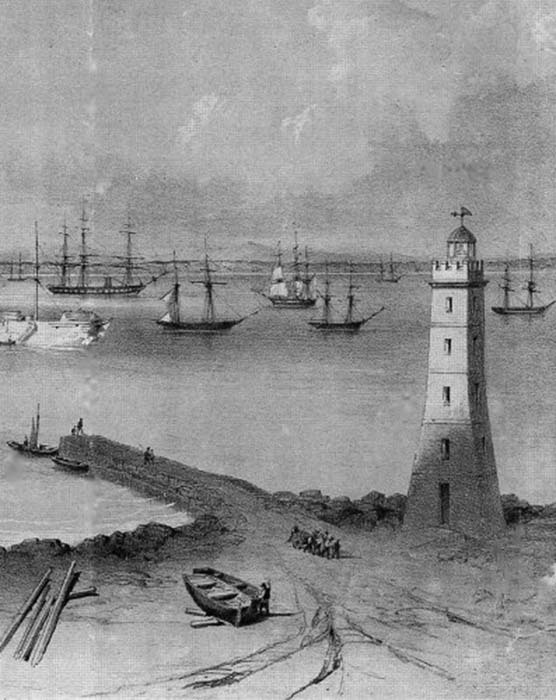 The original lighthouse was constructed in 1840, right on the point of Gellibrand’s Point. It is most likely Victoria’s first navigational aid of any distinction, though an unlit beacon had been on the site since 1835. It also may have been the first harbour light of its kind in Australia. It was timber skeletal structure on a bluestone base with a fixed white light and claimed a visibility of 5 leagues (approx 15 miles). The cost of construction was £50 (£500?). A further £85 was allocated for the annual wage of the Keeper. In 1848, tenders were called for a new lighthouse on Gellibrand’s Point – this is the bluestone section of the tower that remains today. The successful tenderer was James Linacre who built the bluestone lighthouse in 1849 at a cost of £925. With the tower there was also accompanying timber keepers’ quarters. It commenced operations in 1849. It is interesting to note that the old lighthouse was advertised for removal by auction ‘as is’ a month after the new light commenced. It appears that the second light may have been red in colour. The second light operated until 1859 when it was replaced by a floating lightship anchored off the point in 4.5 fathoms of water. The tower was yet to become a lighthouse again in 1934, but not before it served in an interesting role as a time ball tower. As this place was the first permanent settlement is Victoria all survey are measure from the tide gauge at Gellibrand’s Point. In 1853, a Mr R. L. J. Ellery, the first Government Astronomer, commenced determining accurate local mean time, and established a time ball so that shipmasters to correct their chronometers “at the fall of the ball” at exactly one o’clock each day. A time ball was a large copper sphere mounted around a mast. First the flagstaff at the lighthouse was used to raise and lower the ball. It was later moved to the top of the new telegraph station nearby. In 1854, ships captains had complained about the visibility of the time ball so the keeper at the lighthouse would darken the light at 2 minutes to 8pm then reignite the light at exactly 8pm to give the true time. After the discontinuing of the bluestone tower as a lighthouse the time ball mechanism was moved to the top of the tower around 1860. It is definitely known to have been operating there in 1861. The time ball operated from then until 1926 when the keeper fell ill and died. By then most ships had the more advanced technology of wireless communication time-signals. It is said that when the time was turned off not one person in Melbourne even noticed! 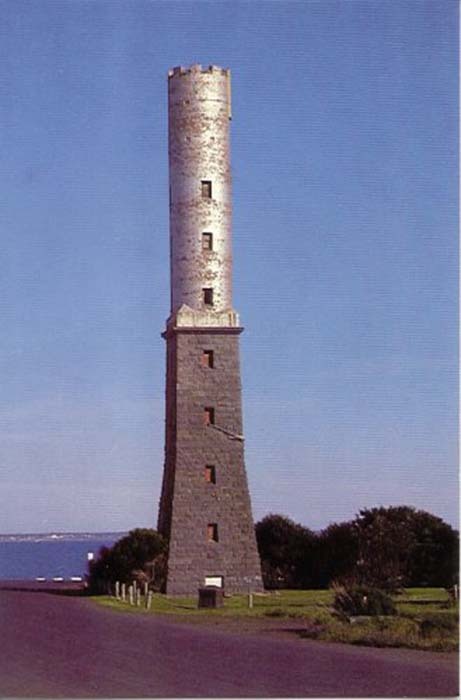 It is not know whether the tower was originally painted white as was done with many other bluestone lighthouses, but in 1907 it was noted that the lighthouse was painted white when the American Fleet sailed in. By 1934 the time ball had been removed. In this year the bluestone tower was extended by 30 feet with a circular brick tower on top. The extension was then painted with a coat of aluminium paint. This was the third lighthouse and operated from 1934 to 1987. It is believed the lighthouse was re-established due to the loss of singularity against the light of the City behind the Point Gellibrand Pile Light. It was electric, gave a green and red light and had a visibility of 15 nautical miles. Between 1987 and 1989, the brick extension was demolished and a functional new replica time ball mechanism was reinstalled restored by the Point Gellibrand Rotary Club to commemorate the history of the site. This was officially opened in 1990. Under threat of subdivision and redevelopment the whole site was declared an historical site by the Premier, Steve Bracks, in 2000. The tower today is operated by a computer, which drops each day at 1pm as when it was in the 19th and early 20th centuries.